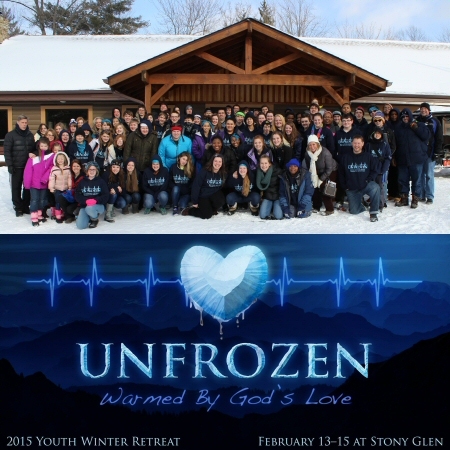 Our 2015 Youth Winter Retreat was a huge success at the beautiful Stony Glen Camp in Madison, Ohio. Our theme for the weekend was “Unfrozen” (quite appropriate as we tried to stay warm with record cold temperatures and wind chills up to -30° below!) . There was 33 teens from our church and 41 teens from Parma Heights Baptist. Pastor Dan Adams, from Parma Heights Baptist, led our sessions, filled with wise counsel from God’s word and object lessons to make the lessons stick. Session One on Friday night talked about people with stone cold hearts, idols in the temple, idols of the heart, and hearts of stone vs. hearts of flesh in Ezekiel 8-11. The commitment: I will have an undivided heart for God! Ezekiel 11:19 & Psalm 86:11. Session Two on Saturday morning was about the loving heart of the heavenly Father from Luke 15:11-27. We all want to do our own thing our own way, and there are consequences of living for ourselves. We have to come to our senses, and see the heart of our heavenly Father. The commitment: When I realize I am wandering from God, I will repent and return to Him! Isaiah 53:6, Romans 5:8, 1 John 1:9. The weekend was also filled with song and great worship time led by Parma Heights Baptist youth’s worship team. Games, hikes, team competitions, free time, cabin discussions, and delicious camp food prepared by the staff at Stony Glen. We even enjoyed a talent show on Saturday evening with lots of teens participating and sharing the talents God has gifted them with! Everyone made it safely home, exhausted, and hopefully a little closer to God and each other in our relationships!